The Westchester/Veterans Station Area TOD Plan is shaped by three major accessibility factors: the Crenshaw Line, which is under construction, the proximity of LAX and the future Automated People Mover, and the existing 405 Freeway. Significant coordination was undertaken with Metro for the design of the new stations. The area closest to the transit station is anchored by a mini-arts district which will serve existing and new artists, new mixed use with residential and retail and a new neighborhood shopping center which will serve both residents of Inglewood and Los Angeles. The southwest portion of the TOD area is proposed as an Office Campus next to the 96th Street Metro Station and LAX People Mover. 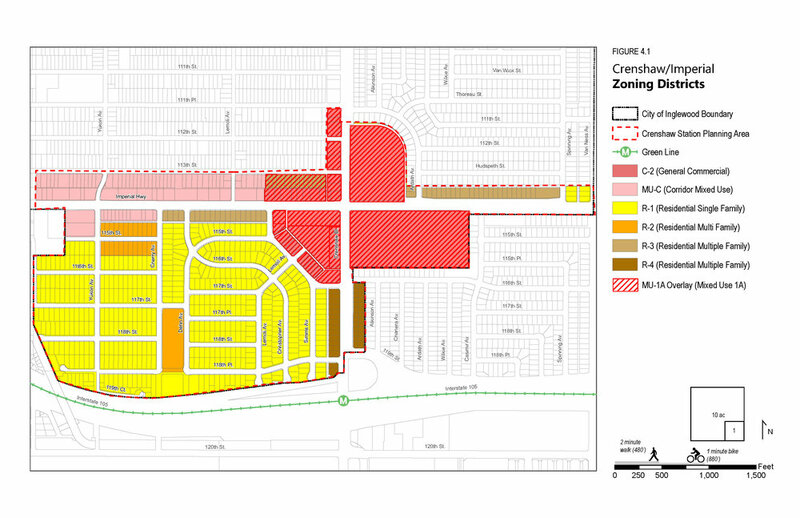 The remainder of the area is proposed for industrial uses related to LAX and new open space. Improved connections across the 405 Freeway make the Crenshaw Line station more accessible by pedestrians and bicyclists. The Crenshaw/Imperial TOD Plan introduces mixed-use on all four corners at the intersection of Crenshaw Boulevard and Imperial Highway. Introducing potential residential uses to these four corners will both greatly enhance transit ridership and position the single owners of the three, traditional shopping centers to restructure uses in the face of new competition from changing retail patterns from Hollywood Park and from Internet shopping. Sixteen acres of new public-accessible open space is scheduled to be created by the mixed-use projects, making them supported by adjacent residents. Crenshaw Boulevard’s beautiful, existing pine trees are preserved and a bicycle sharrow is added to the existing frontage road to provide for easy bicycling to the Green Line station located within the 105 Freeway. Reconfiguration of the 105 Freeway interchange is proposed to eliminate unsafe pedestrian cross-traffic with the freeway ramp and to create a pleasant pedestrian path to the mixed-use development to the north. The leftover space provides a great opportunity for gateway art announcing the entry to the City of Inglewood to the north and the City of Hawthorne to the south.